Hotel GOGAR offers a warm family atmosphere in a rural environment. 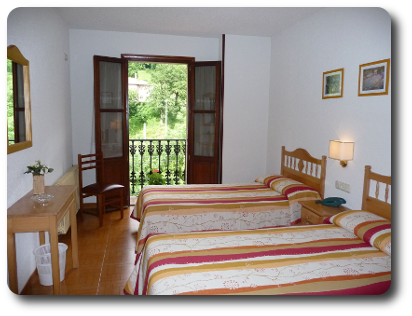 The hotel has 22 spacious outside bedrooms overlooking the Cantabrian Mountains. Every room offers a private bathroom (shower/WC or bathtub/WC), direct phone line, wake-up calls, High Speed Wi-Fi or dial-up internet connection. Extra beds possibility attending to customers´ needs. Maximum capacity: 49 people. Lift/Elevator-TV, room-Terrace-Cafeteria, service-Restaurant, Easy Parking-Motorcycles /Bicycles Garage. High Season: 45 € room. Low Season: 40 € room.